Iran is the only country in the world that allows its citizens to trade with organs. While the practice is widely frowned upon, simply banning an open market for organs is not that straight forward, writes Ellie Karoubi. It is really quite disturbing to see people spray graffiti on the walls of Tehran as a form of advertisement for their organs. They put their blood group in red with a telephone number next to it: “O+ kidney for sale, call for more details…prices negotiable”. Certain websites exist where potential buyers purchase kidneys at the best negotiable price, which starts at roughly £4000. Some even publish related articles on other websites that are meant to advise sellers when to sell their kidneys, ideally at a later date when the prices are likely to go up. But the advertisements hardly avoid protests. 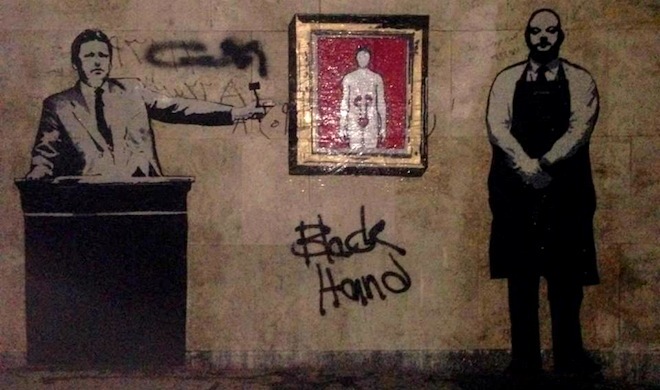 A street artist known as Black Hand, or the ‘Iranian Banksy’, recently drew an artistic picture of a kidney being held at an auction. Iranian cinema also addresses this issue critically, as in the film ‘The Final Whistle’ (2011) which illustrates a story of a desperate young girl (Malineh) willing to sell her kidney in order to raise enough Diyah (blood money which is a financial compensation paid to the heir of the victim under Islamic law) so that she can save her mother from being executed after accusations of murder. Iran is the only country in the world that has legalised the selling of organs. But the question as to whether it has worked well is debatable. It is true to say that due to the competitive market for selling kidneys, Iran, as a result, certainly faces no kidney shortage. As a contrast, countries like the UK face a real problem. According to giveakidney.org, 300 people in need of a kidney die each year in the UK alone, and around 6000 people are on the waiting list for a kidney transplant. Although one of the benefits of allowing the selling of organs such as kidneys may be that it tackles the issue of shortage, one of the arguments against this legislation is that the less privileged are the ones who suffer. Many in Iran who are in need of a kidney cannot afford to buy one. On the other hand, given the current economic circumstances that Iranians face, some members of the public have no choice but to sell their kidney due to financial necessity. I spoke to Hamed, a 24-year-old male kidney seller in Tehran, and I asked him why he is willing to undergo the process of selling his kidney at such a young age. He said, “things from food to paying rent is becoming more and more expensive everyday and so, I have no choice…the sanctions really put a lot of pressure on us”. As Francis Delmonico, a Harvard University professor, rightly explained in the Wall Street Journal, ”it’s the poor person who sells”. The Iranian concept of a legal market for human organs is widely considered repugnant. Some suggest that if the Iranian legislature decides to adopt presumed consent legislation, then this would benefit all members of the public. The consequence of presumed consent legislation is that it will make organ donations compulsory for all. It has many advantages, including the rise of the number of lives worth living for both the rich and the poor. More importantly, there would be a fall in the growing market of organs, and if someone is unhappy to donate their organs after death, they will have the option to opt out. Yet, most people do not die prematurely, and the wait for someone to actually pass away in order to receive an organ may be too long. However, by looking at the statistics of Iran’s high number of road accidents alone, you may think otherwise. According to unicef.org, the rate of road accidents in Iran is twenty times more than the world’s average. Each year, road traffic accidents kill nearly 28,000 people in Iran and every 19 minutes one person dies on the country’s roads. The road accidents in Iran are so high that during rush hour, it is not surprising to see several accidents. So, why should we allow the benefit of organ sales to go waste when it can be used to save lives? As Randall states in the title of the American Medical Association Journal, “Too few human organs for transplantation, too many in need… and the gap widens”. Even though a presumed consent system would be more practical and beneficial for many countries, most notably for Iran, the violation of autonomy is a sensitive issue amongst many people around the world, including Iranians. At the same time, something has to be done about the current organ trade since its mere existence is commonly frowned upon, and until the majority of the Iranian people decide to express their concerns around this issue, nothing will change. “Personally, I never liked the idea of selling my kidney, but when faced with such huge economic pressure, that is when I think to myself, why not? At least I have the freedom to choose what I want to do with my body, even if that includes selling my own kidney. And at the end of the day, I am not doing anything that is against the law”.